As a thank-you, we will be highlighting some of the wonderful people and businesses who are working hard to make this evening the best it can be. Today's interview is with Marlo Moore of High Fidelity Hair, one of 14 salons participating in SHINE! Please share a bit about (salon) - when was it opened, what is the salon's approach/philosophy? Located on Commercial Drive, High Fidelity Hair opened it's doors in Spring 2013. As a team of hair professionals. we strive for excellence, innovation, equality, and sustainability. We have a diverse, fun, fresh and friendly salon environment that keeps our clients coming back for more! 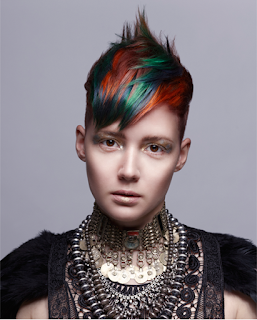 As creative colour specialists, we love to push the boundaries and create new trends. High Fidelity Hair on Commercial Drive is Vancouver's first unisex hair salon where prices are based on length and complexity of the appointment and not the client's gender. Once part of a franchise system, in May 2013 co-owners Marlo and Jarod Moore decided it was time for their Commercial Drive salon to say "out with the old, and in with the new". Voila! High Fidelity Hair was born. We offer a full range of hair services including cuts, colour, extensions, styles, hair tattoos, barbering, waxing, and more. As creative colour specialists, we carry high-performance colour lines featuring bright and vibrant Goldwell Elumen, TopChic, and Colourance. We pride ourselves by carrying high-quality yet affordable products. We currently have 11 stylists and one esthetician. We offer our clients everything from classic cuts and colours to unique avante garde cuts and vibrant colours. We also do barbering and grooming, waxing and make up. What would you most like future clients to know about High Fidelity Hair? We carry professional haircare products at an affordable price in a modern unisex salon. Our prices are based on length and complexity of the appointment, not your gender. At High Fidelity we aim not only to give our clients incredible "selfie" worthy hair, but also to create a fun, relaxing and inspiring salon environment. For a consultation you can call 604-696-0009, book on our website www.highfidelityhair.com or stop by the salon! #nostigma Canadian Mental Health Association charity Dean Thullner events fundraiser hair salon lounge high fidelity hair Marlo Moore mental health SHINE The Lions Gate Hospital HOpe Centre.